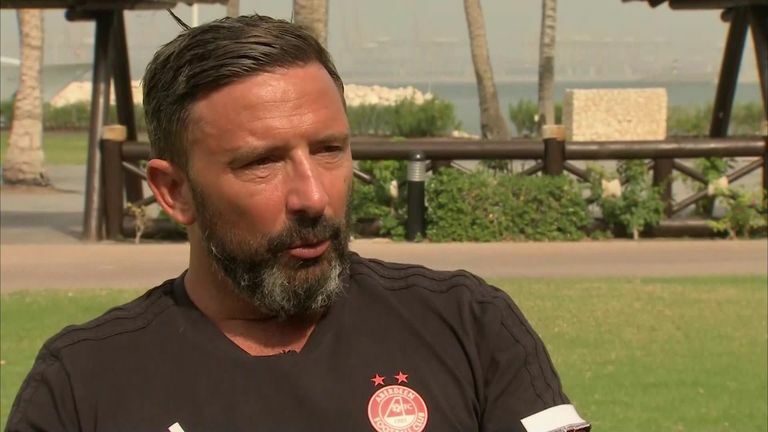 Derek McInnes is pleased with how his Aberdeen side performed in December as he was named Manager of the Month but says it is hard to win consecutive games in the Scottish Premiership this season. Aberdeen boss Derek McInnes has been named Premiership Manager of the Month for December while striker Sam Cosgrove has been handed the player award. The Dons won six of their eight Premiership matches during December, including an impressive victory at Rangers and a 5-1 thrashing of Dundee at Pittodrie. Cosgrove was integral to Aberdeen's strong form, scoring seven goals in as many games as they ended the month fourth in the table, just three points behind leaders Celtic. The 22-year-old scored both goals in a 2-0 win over Hearts, although he was sent off at the beginning of the month during the win at Ibrox. Cosgrove had only scored two goals all season until December, but has now taken his tally to nine to become joint-second top scorer in the Premiership. Aberdeen are currently undergoing a training camp in Dubai during the winter break, with their first match back coming against Stenhousemuir in the Scottish Cup on January 19.